The committee's vote — and continuing support for the bill from the Liberal government — amount to a victory for animal rights activists who maintain that holding these highly intelligent creatures in concrete tanks is a cruel and perverse form of entertainment. "The bill is a simple and straightforward one. It works from the presumption that placing these beautiful creatures into the kinds of pens that they have been kept in is inherently cruel," Independent Sen. Murray Sinclair, the former judge who helped usher the bill through Parliament after Moore's retirement, told the Commons fisheries committee. If it's passed by Parliament before it rises for summer prior to an expected fall election, the bill will levy fines of up to $200,000 on parks and aquariums that are found to have violated proposed animal cruelty provisions in the Criminal Code. Camille Labchuk is the executive director of Animal Justice, an advocacy group that has long backed the bill. She said that while the legislation is still facing a parliamentary time crunch, she's confident it has enough votes to clear the Commons when it comes up for a final vote. "I am delighted that the Liberals resisted pressure to kill the bill. I think the reason they were convinced to save this legislation is because ... of the power of Canadians who contacted these politicians in droves," she said in an interview with CBC News (Liberal New Brunswick MP Pat Finnigan withdrew three such amendments Tuesday night). "Probably over 20,000 e-mails and phone calls were made in the days proceeding this vote. This [captivity ban] is something Canadians across the country are really ready for. They've seen Blackfish and The Cove, they understand that whales and dolphins shouldn't be kept in tanks anymore — those in the wild travel vast distances, dive deeply, live in complex family structures and enjoy a quality of life that is much better than the abject misery and barrenness of living in a tank." 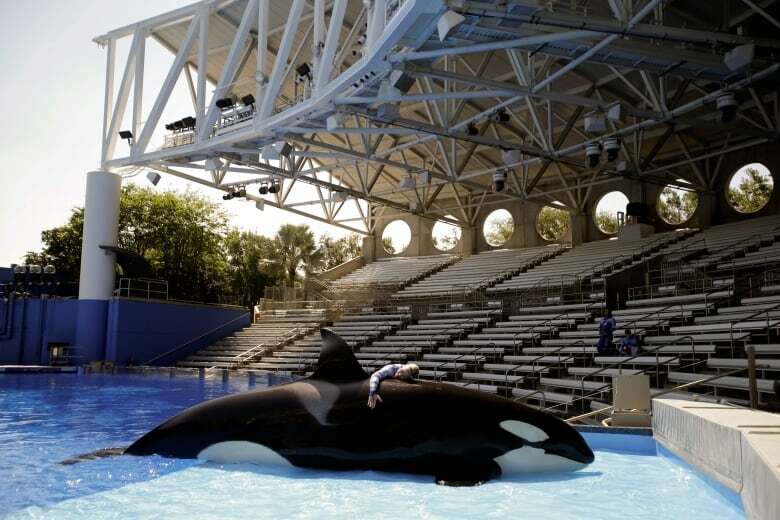 However, existing cetacean stocks will be 'grandfathered' by the bill, meaning the park can keep all the animals it currently owns. According to data supplied by the Department of Fisheries and Oceans, Marineland owns about 61 cetaceans: 55 beluga whales, five bottlenose dolphins and one orca, or 'killer whale'. The Vancouver Aquarium has just one such mammal left. "Marineland has enough beluga whales in existence to probably continue for another 30 years, so no jobs are going to be lost as a result of this in the immediate future," Sinclair said. "This [bill] is necessary because, in the long run, our society will be much better off if we start to treat other creatures ... in the same way that we ourselves feel that we should be treated." The hope of many activists is that some or all of the mammals currently in captivity will be 'retired' eventually and moved to an open water seaside sanctuary in Nova Scotia.